As threats grow in number and complexity, more and more organizations are looking for smarter, better approaches to cybersecurity. So what’s Synchronised Security? A cybersecurity system that enables your defenses to be more co-ordinated than the attackers! Synchronized Security is cybersecurity as a system. Security products actually working together in real-time. It connects individual security solutions to elevate your protection while taking the burden off IT. It enhances your defenses so you’re more coordinated than the attacker. Fantastic products that are great on their own, but even better together. How does it work? There are three pillars to Synchronized Security: Discover, Analyze and Respond. Firstly by enabling products to automatically share information it discovers hidden threats and unknown risks, enhancing your security. Second, it gives you real-time analysis and reporting across your whole estate. So you can see the big picture. You can see the wood as well as the trees. And thirdly, it responds automatically to infections and incidents – in seconds. One of the ways Sophos does discovery is with Synchronized App Control. Synchronized App Control, one of the core Synchronized Security features and unique to Sophos, is a fantastic enhancement to your security and is possible because Sophos Endpoint and Sophos XG Firewall actively work together sharing information. As we’ve seen, on average 45% of network traffic goes unidentified. Sometimes that’s because they are custom applications, sometimes because the app wants to hide as it’s up to no good. 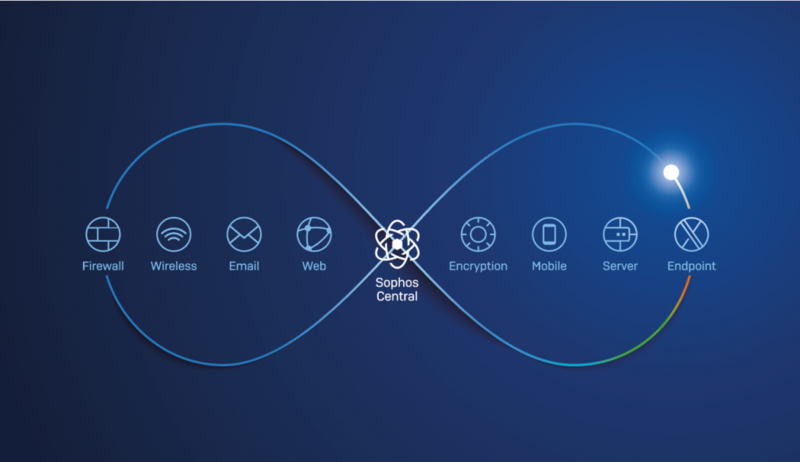 With Synchronized App Control, Sophos Endpoint tells Sophos XG Firewall exactly what each app is. So you go from the poor visibility we have on the left to the absolute clarity of what’s running on your network on the right. And because you have visibility into your network traffic you can now identify unknown threats and unwanted apps that are running on your network, putting your organization at risk and impacting user productivity. Indeed 1/3 of customers have discovered up to 100 unknown apps with Sync App Control – the remaining 2/3 have discovered over 100 new apps. Incredible insight that puts you back in control. Is it easy to activate? Advanced cybersecurity systems used to be the exclusive preserve of the largest organizations, manually stitching together multiple products and burning IT hours triaging the results. Something that was incredibly complicated and labor-intensive, and out of the question for anyone who didn’t have a dedicated cybersecurity division. 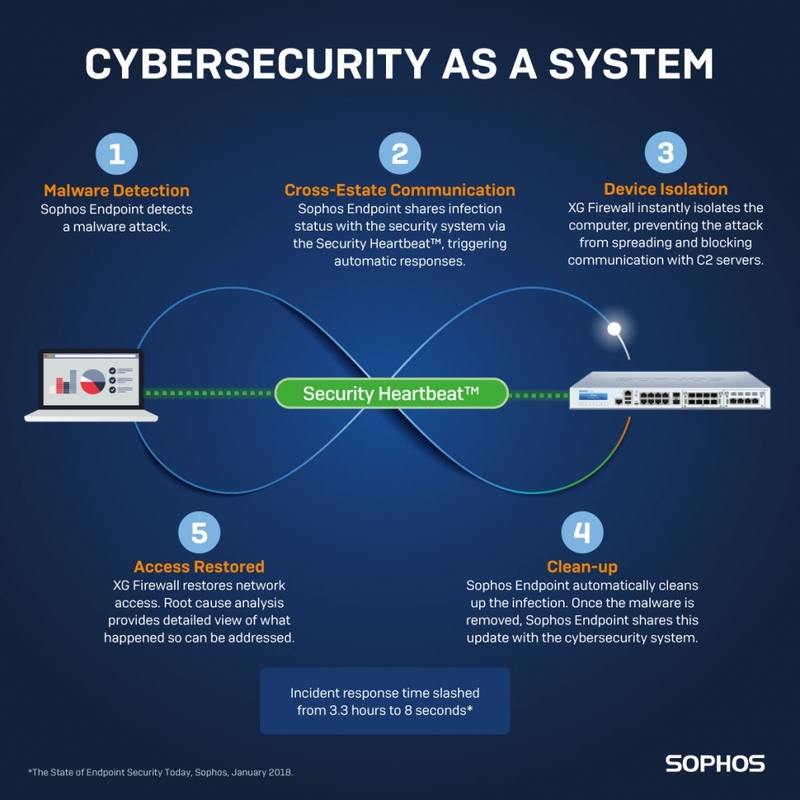 Sophos Synchronized Security is different. It’s enterprise-grade protection, automated, for everyone. It works for bit organizations, giving them all the insights they need. It also works for smaller ones. And 8 out of 10 customers agree that it’s easy to activate. So to sum up, Synchronized Security is cybersecurity as a system. It brings interconnectivity to security, enabling solutions to work together as a system. It enables you to discover unknown threats, get instant, cross-estate analysis, and also respond automatically to threats. Elevating your protection and making life easier for IT. And customers agree.